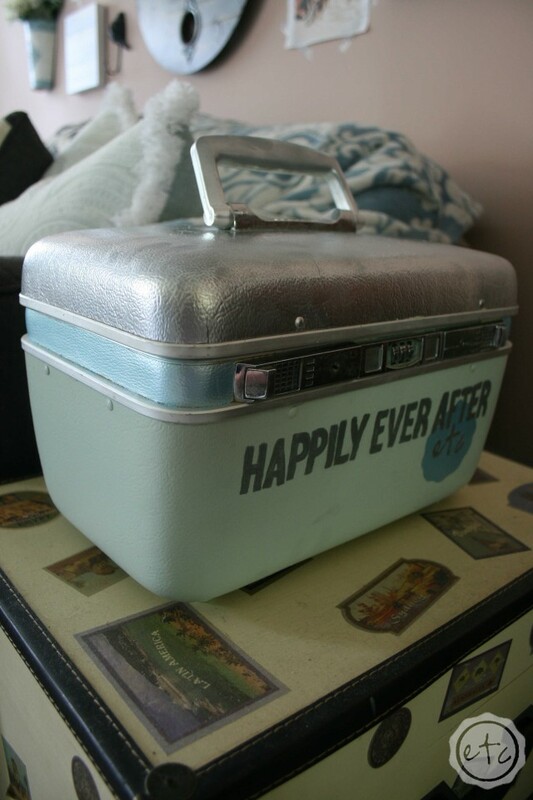 A Vintage Suitcase Makeover - Full Tutorial! 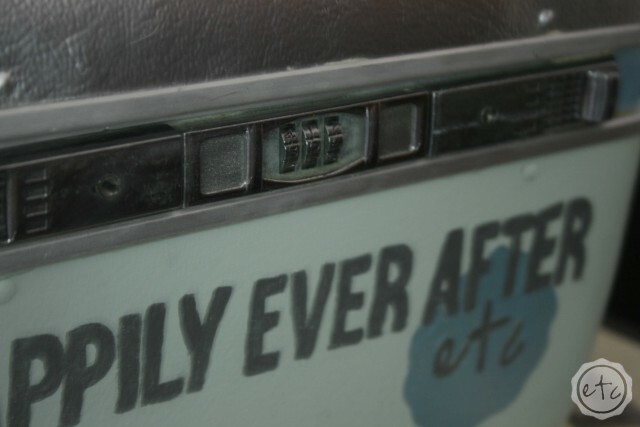 - Happily Ever After, Etc. 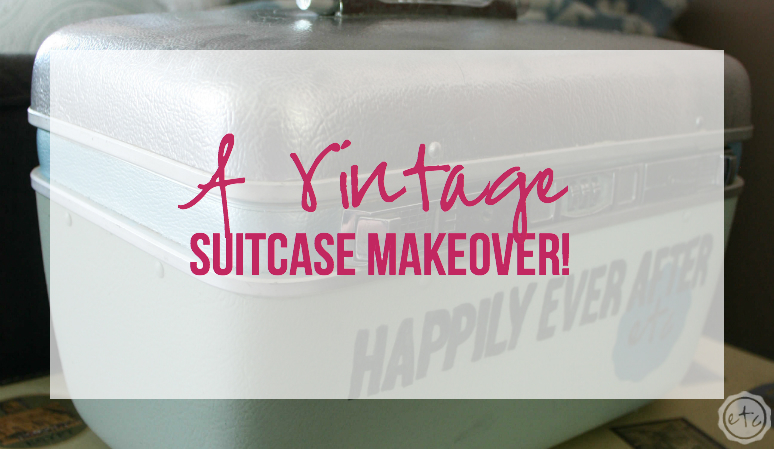 A Vintage Suitcase Makeover – Full Tutorial! 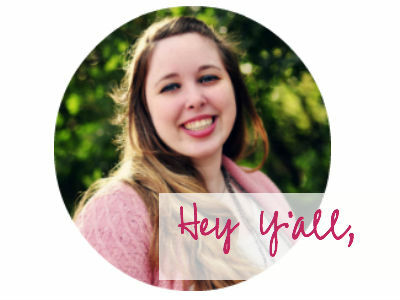 A couple of months ago Kendra asked me to share this lovely little project with her readers over at the Kreative Life! It was such a fun project (and it turned out way better than I ever thought it would!) When we were unpacking the living room last week my hubby pulled this out of a box and I realized… I never posted it here! Silly me! So here it is… my painted vintage suitcase makeover! 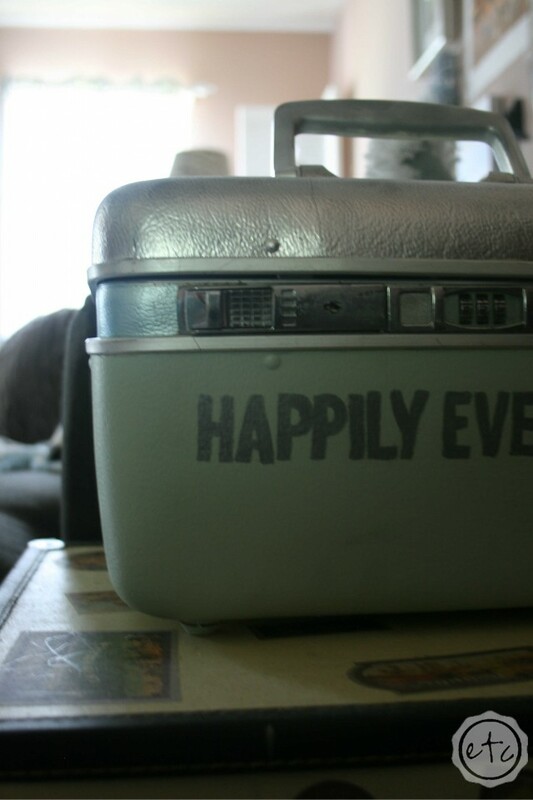 If you’re anything like me you are loving the vintage suitcase trend that’s going on right now. I tend to be drawn towards anything that contains things (read as: stores all my crap out of sight) so vintage suitcases are perfect for me! 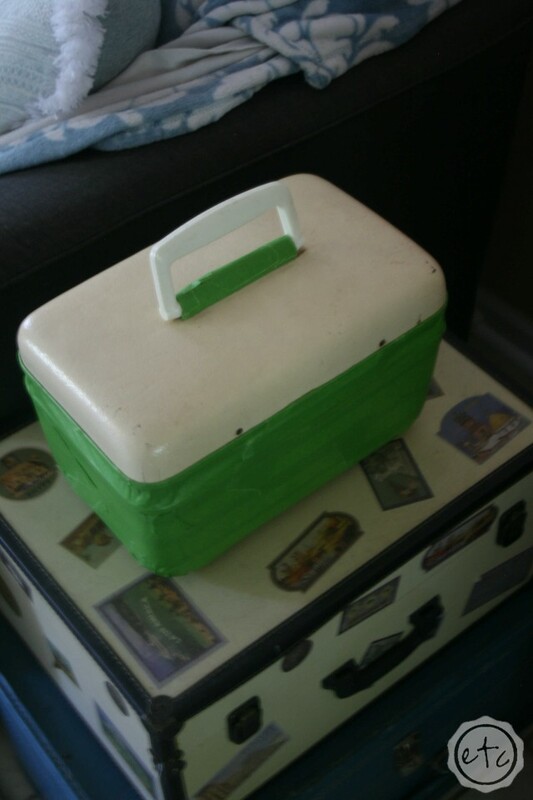 In addition to larger suitcases I have found adorable children’s suitcases, hat boxes… even a vintage bowling ball bag! The key (for me) is finding that perfect colored bag… the one that looks amazing with all the rest of my pretty things (read as: hoards of useless antiques that aren’t really useful but I need to have anyways). Of course it’s hard to find suitcases in baby blue and cream… not impossible but hard! 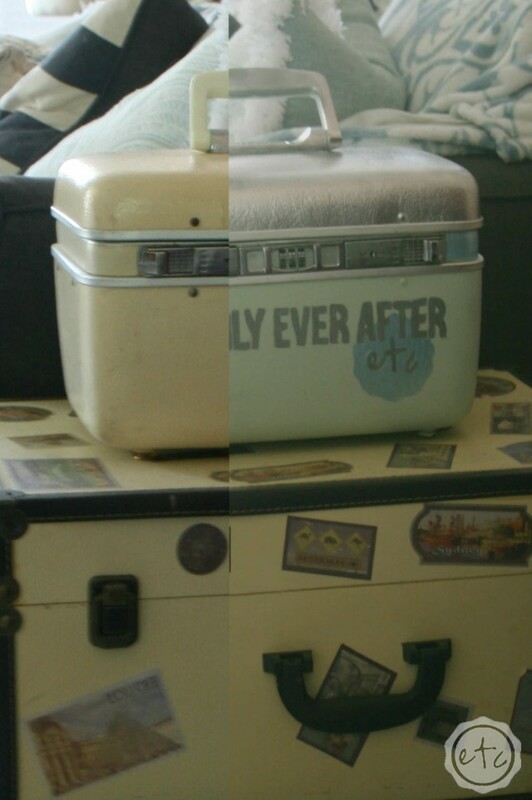 It’s much easier to find old beaten up, scuffed up suitcases in need of a little TLC! I have never tried painting a suitcase before but I figured… what’s the harm? So I went to my local antique store and found the perfect culprit suitcase! A teeny little make up box in light yellow… the exterior was actually in great shape and might look great in a home that used more yellow. In my home it looked a bit more washed out cream then yellow. Either way it was only ten bucks so I didn’t feel bad painting it! 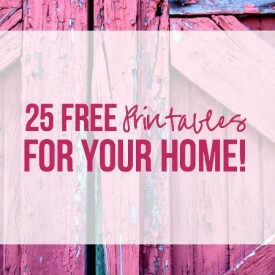 Looking for a bunch of posts on DIY & Crafts? I’ve got you covered! 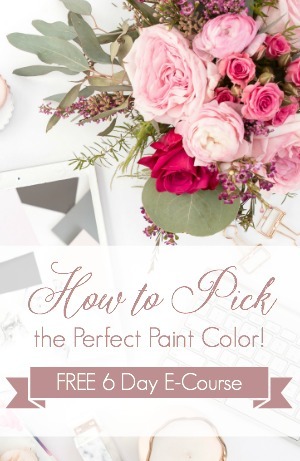 Click here to see all of my how to DIY & Craft posts in one place! 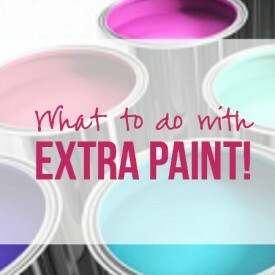 Paint brushes in varying sizes if you plan on adding a quote. Frog tape for taping off crisp clean lines. That’s it! Didn’t expect it to be so short did you? I like to surprise people… I’m fun that way. The first thing I did was tape off the entire bottom of my suitcase. I wanted the hardware to stay it’s original color and I wanted to paint each section a different color for a striped effect. Once it was taped off I took this little cutey outside and spray painted the top stripe and the handle with a looking glass finish spray paint. I wasn’t sure I would like the shiny finish but I had some paint left over from my Mirrored Mason Jars and didn’t want to buy more paint for a little suitcase… I figured if I didn’t like it I could always paint over it! But if you’ve known me for five seconds you know I’m a sparkle freak… so I LOVED the shiny finish! So I decided to run with it and bought little bottles of metallic finish craft paint for my lettering… since they were only 1.47 a bottle I thought it was worth the splurge ;). After the first section dried I removed the frog tape, taped off the top and painted the bottom stripe! (Again using leftover seafoam paint from my dresser reveal). Then I painted the middle stripe. All of this painting took a while but I was able to watch several episodes of Once Upon a Time while waiting… so it wasn’t too bad! Once the stripes were painted I printed off a copy of my quote: in this case my blog logo from Happily Ever After, Etc. 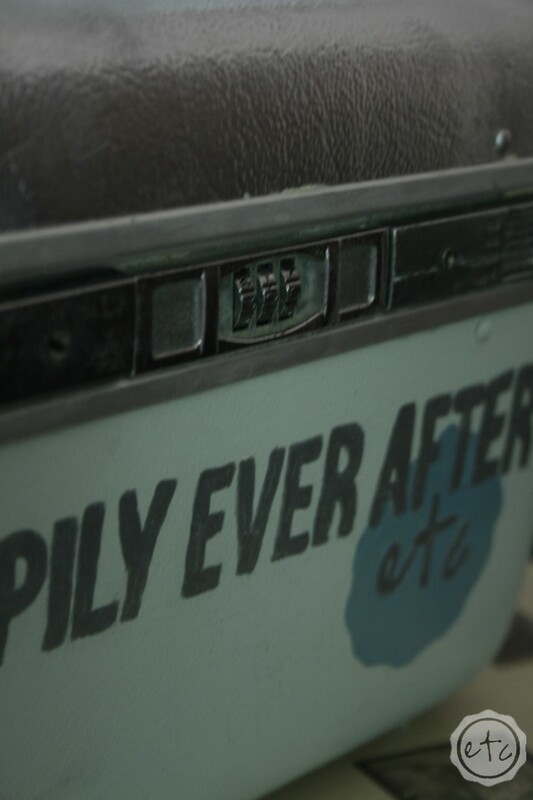 I went back and forth about it for a while… but in the end I just thought it fit this little suitcase best. I’m looking forward to seeing it NOT on my computer every day! To transfer my logo I used the old trace the letters on the backside of your paper with pencil and then rub on the front side of the paper trick. It transferred the lettering like a charm… then all that was left was filling in the logo with paint! I choose a small paint brush and very carefully painted the letters and wax seal… twice. I wanted to make sure they looked crisp and sharp. I love how it turned out! I was a little iffy on the color scheme at first but I think it looks just like spring! What do y’all think… is painting suitcases up your ally? I’d love to see more! 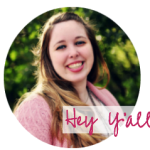 Linking up with: I Heart Naptime! This is adorable! What a fun revamp. I just moved to a new area and need to find some local thrift stores to browse through! That’s so much fun! I love finding new thrift stores… that’s my favorite part of any trip! Finding new stores and new treasures! Good luck and thanks for stopping by! 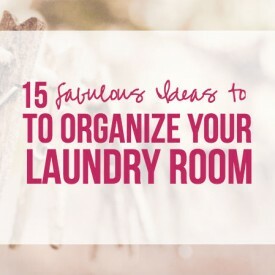 What a cute DIY project that will add extra storage to a room. I can see my current knitting project stashed in it! Such a good point Cynthia! I love projects that add extra storage to a space… makes it so much easier to hide all your stuff! Thanks for stopping by! Thanks Gemma! You’re so sweet! You’re such a sweetheart! Thanks for stopping by Lorinda! How cute! This would make an amazing wedding gift! Especially filled with booze. Haha! I never thought of it that way… but I suppose you could put booze in it! This is SO incredibly adorable! What a great fun project!! 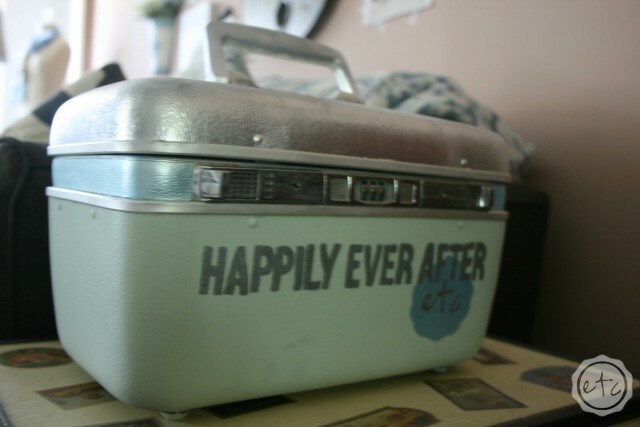 now I want to go to thrift stores/garage sales and find a little suitcase so I can do this, too! XOXO and hope you have a great weekend! You’re such a sweetheart! Half the fun is finding a cute suitcase… and trust me, they’re everywhere! Thanks for stopping by Charlotte! I can’t wait to see! I’m so excited you liked it! Thanks for stopping by! That is so incredibly cute. I Love how it came out. Aren’t you a doll! Thanks for stopping by Robin! You’re so sweet! I totally understand why you’re a fan of vintage suitcases… I tend to collect them! Thanks for stopping by Autumn! You’re such a sweetheart… thanks for stopping by Kenzie! You’re so sweet! 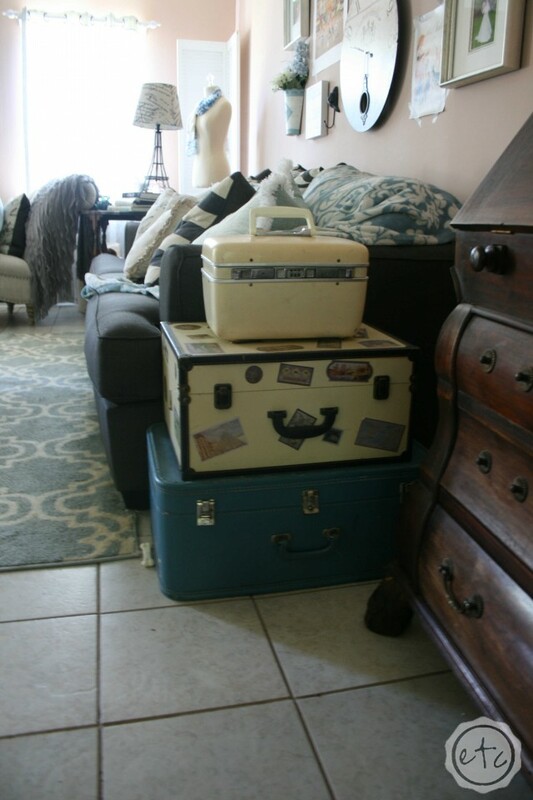 I love how vintage suitcases look… especially because they’re added storage! Good luck finding a few of your own! Thanks for stopping by! I love it! So cute, while also useful. Thanks for sharing. Cute and practical… my favorite combination! Thanks for stopping by Caitlin! This is sooo cute! Great job, I love it! You’re such a sweetheart! Thanks for stopping by Leah! What a fun DIY! I see so many of these things at thrift stores and antique malls. I might have to grab one next time. So cute. I love the case and how it turned out. Such a great idea. Wow, that’s really creative! I didn’t realize vintage suitcases had become a “thing”. But I dig it! Great job on this! Very creative! I love projects like this making something fresh out of something old. I completely agree! I love breathing new life into old pieces! Thanks for stopping by! I just purchase one through an auction with Goodwill. I good a mint green one which is difficult to find. 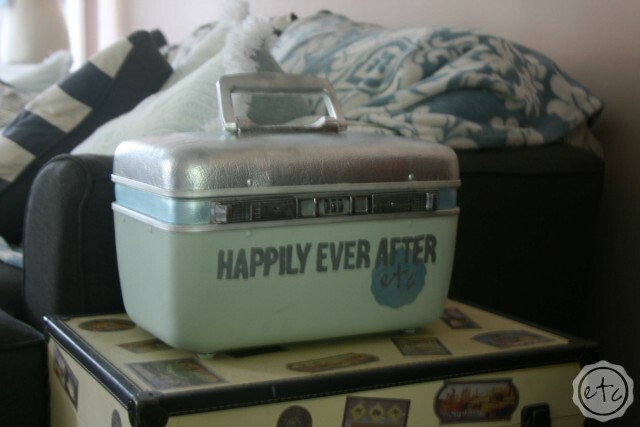 I will use mine as a bridal shower gift containing all honeymoon items for when to go to Positano. A good mint green is hard to find! I am so jealous! Thanks for stopping by! That’s okay Claudette… not everyone loves DIY! Thanks for stopping by! So cute! my mom has a suitcase like that right now that she still uses when she goes on trips!!! It’s so old! That’s so cute! I love when people actually use old suitcases for trips! Thanks for stopping by Danielle! haha I have 2 of those makeup cases myself. I may have to try something like this. Thanks for sharing. You totally should Carolyn! Then you should show me pictures 😉 Thanks so much for stopping by! I never thought of painting vintage suitcases, but those are super cute! Didn’t it turn out cute? 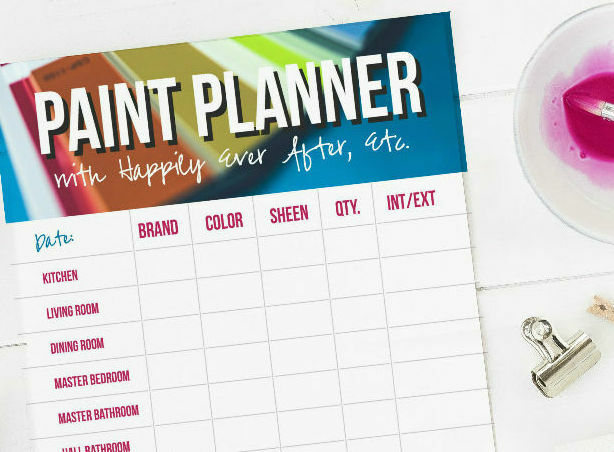 I never thought of painting a suitcase either… until I saw something on Pinterest where a suitcase was painted (I think to be an end table)… it got me thinking! Just because something starts a color I don’t like doesn’t mean it needs to end that way! haha! Thanks for stopping by Julia! Nice color choices! 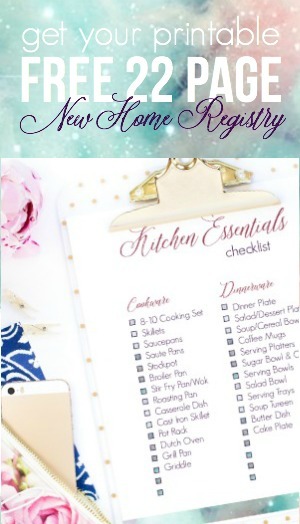 I love that you used the same font from your blog title! What a fun project! It just seemed to fit on there! I kept playing around with different quotes and coming back to this… even though the lettering was fun to paint! Thanks for stopping by Elizabeth! What a fun idea! I love DIY projects. DIY is definitely the best! Thanks for stopping by Jonathan! This is really cute! I love updating vintage items! Updating is the best… you’re giving new life to something forgotten! Thanks for stopping by Jamie! This looks really awesome. I used to craft a lot and now the time just seems to run away. Omg what a great tutorial!! that suitcase came out great!!! You are such a doll! I’m so glad you liked it! Thanks for stopping by! I can’t believe how cute that came out. It makes me want to try it myself. I do love the vintage suitcase look. It turned out way cuter than I expected! I was super hesitant at first (I’m not stellar at painting free hand) but I just had to try! 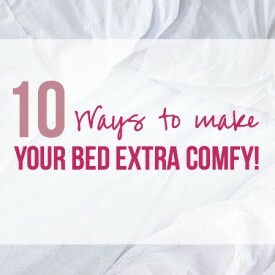 You should totally make one… then show me what you did! I’d love to see! This is such a cute idea! Will definitely try this. I’m so glad you liked it! Thanks for stopping by Maya! How cute! I like what you did to make over this vintage suitcase. Thanks hon! I’m so glad you like it! Thanks for stopping by! Very cute! I recently picked up a vintage train case and gave it a complete makeover. U never would of thought of using a looking glass paint. I’m not to good at spray painting either. I love how yours turned out, very pretty!